Locatie: Monterosi, Anghiari 52031, Arezzo. This is a week long festival of 5Rhythms dance and movement exploration with yoga every morning and some other guests brining their practices, some dance movement practices, free expression theatre work and other surprises. 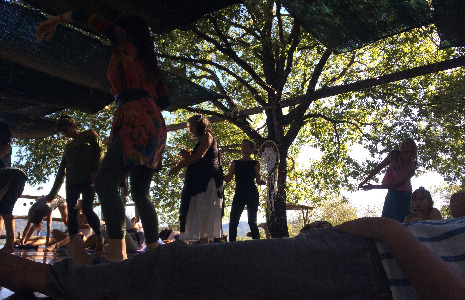 All outdoors on our beloved open air dance floor in the midsts of the Tuscan hills. The invitation and inspiration of this festival is to connect to our inner creativity and healing through a deeper connection with nature, movement and tribe. There are some places to sleep in the house with shared bathrooms. Otherwise there are places to camp, bringing your own tent or van with outside bathrooms.